Luckily for those of us who are mechanically declined, gold pans do not have buttons, meters, scales, or electronics. 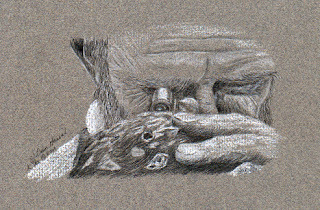 In the old days, prospectors just used their tin dinner plates. Today, space age plastic pans make gold panning a little easier. To start with, you are not going to get rich panning. A gold pan is just a tool to help you find a gold deposit and you cannot process enough material to make any money from the gold you recover in a plan. Second, make sure you have a strong back and find the most comfortable place you can find and sit down. Don’t squat like many people show in photos. Instead, take off your shoes and socks and put your feet in the water, or wear some water proof boots as you pan – you will thank us later. You need a gold pan, possibly a grizzly pan (a pan with about a quarter inch in diameter holes drilled in it as this will sit inside your pan. You may even want to take a piece of fly screen with you that is as large as the gold pan – these latter two items are for screening. Next you will need a shovel to dig material from the stream or stream bank, a 10 power hand-lens so you can see all of that gold you find, and next, if you are in bear country, don’t forget that you are not as high on the food chain as that bear. 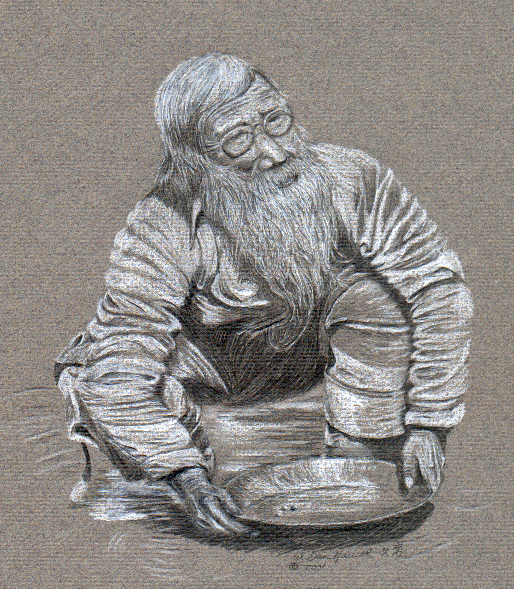 Gold panning works because of gravity and fluid dynamics. 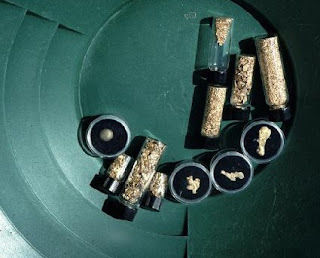 All of the minerals you will be working with as you pan, have unique specific gravities (distinct weights for their volume), thus gravity will pull more on those minerals with higher specific gravity (such as gold) and drag them down onto the surface of the gold pan. The gravel or soil that hopefully contains some gold, when this is permeated with water, it will tend to behave like a liquid, thus you will likely have to stir up the dirt after placing it in your pan with your hands. To begin, place the grizzly on top of your gold pan (not the bear, but rather the sieve). If you have some fly screen, you can place it in between the pan and grizzly. 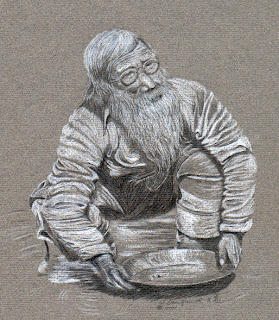 Fill the screen with gravel and next place the entire pan and sieve under water working the finer-grained material through the holes in the grizzly. Soon you will have the material larger than the quarter inch sitting on your grizzly pan. Look for the large nuggets and diamonds – if you don’t have any, place this waste material into a pile on the stream bank (this will be a measure of how much material you can pan through in an hour or a day (this is only for your own information). Now you can do the same with the fly screen, or you can skip this part altogether. As you pan, you are going to keep about 1/3 of the pan in water at an angle about a 30 degree tilt. Now start washing the lighter material off into the creek by using a roughly circular to elliptical motion while always keeping the lower 1/3 of your pan in the water. Don’t worry about panning too hard or fast, it is not easy for the gold to fall out of the pan. If you are looking for diamonds and other gemstones, take it a little easier. Soon, you should start seeing a lot of dark to black minerals along the edge of the lighter-colored minerals. Most of the light minerals should wash over the lip of the pan. These are the famous ‘black sands’ that we’ve all read about in gold prospecting books. Now that you have mostly black sands left in our pan. Try something different. Lift the pan out of the water. With the bottom of the pan filled with water, start slapping the edge of the pan with your right (or left) hand while hold it in the other. You should see more separation of the black sands and if you have any gold, it should start separating from the black sands. If you have ever heard of a Wilfley Table, this is basically how it works, but on a much larger scale. At first, it typically takes a person a fairly long time to concentrate the material in their first few pans, but after a little while, you will be an expert and it shouldn’t take much more than a minute or two to pan through material. Now, don’t mistaken the mica for gold – this is much more common mistake than those who mistaken pyrite for gold. Mica occurs as tiny flakes and we all want to see gold, so most people will convince themselves that they have gold. But mica will roll over and over in the water – gold will sit tight. With your hand lens, start looking for some tiny, equidimensional red mineral grains. These are probably garnets. If they are clear enough and large enough, they might be gem quality. 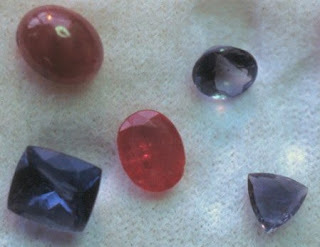 If they are larger than about 2 or 3 millimeters in diameter, they can actually be faceted. Now lets look for ruby and sapphire. These will form hexagonal prisms (6-sided prisms). If you have any, you better start panning upstream until you run out of these crystals and they start looking either for mica-rich schist, serpentinite or marble – and then send me some of the larger crystals. Now look for diamonds. These will be roughly equidimensional, they may occur as cubes, octahedrons or similar crystals and look distinctly greasy. Nuggets are uncommon. 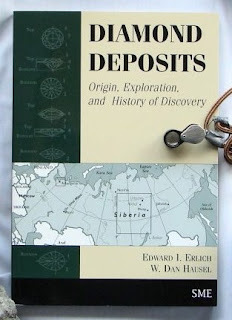 Even so, many nuggets recovered on Julian Creek in the Kuskokwim Mountains of Alaska in 1988 were attractive. But these were tiny compared to some larger nuggets that have been found. The largest nugget found in Alaska was softball size and named the Centennial Nugget and weighed 294.1 ounces. This giant nugget was found in Swift Creek near the town of Ruby. water and growing in place. Gold nuggets are the result of the native metal eroding from nearby outcrops and thence being carried down-slope by the effects of gravity often with the assistance of water. There is also evidence that some nuggets may be precipitated from organic rich water and deposited in place. But the majority of nuggets are thought to have eroded from nearby lodes. Some nuggets found in the Greaterville district in southern Arizona are reported to have galena attached to the metal. Galena is a very soft lead-sulfide with perfect cleavage that will break down over a very short transportation distance. 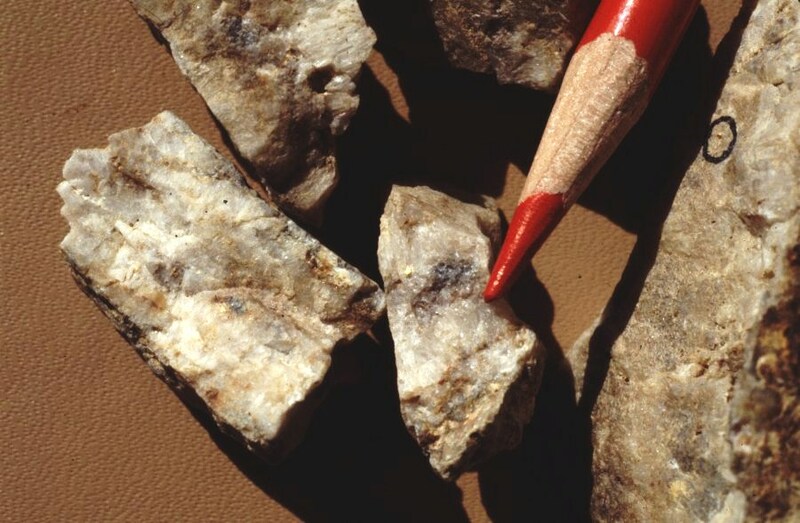 This along with angular rhyolite and granite lithic fragments in the placer strongly supports that the Greaterville nuggets had a proximal source and likely were eroded from nearby argentiferous galena-rich quartz veins and chalcopyrite-bearing granite (Hausel, 2011b). The weight of nuggets and precious metals in general is typically reported in troy ounces (the troy ounce was part of the Roman monetary system). One troy ounce is equal to 1.09714 avoirdupois ounces. Later standardization changed the ounce to 1/16th of a pound (avoirdupois ounce), but the troy ounce (which is heavier than the avoirdupois ounce) was retained as a measure of precious metals. A troy ounce contains 31.1 grams while the avoirdupois ounce has 28.35 grams. This difference has unfortunately resulted in considerable confusion in the literature. Gold nuggets are often sought by prospectors and treasure hunters. 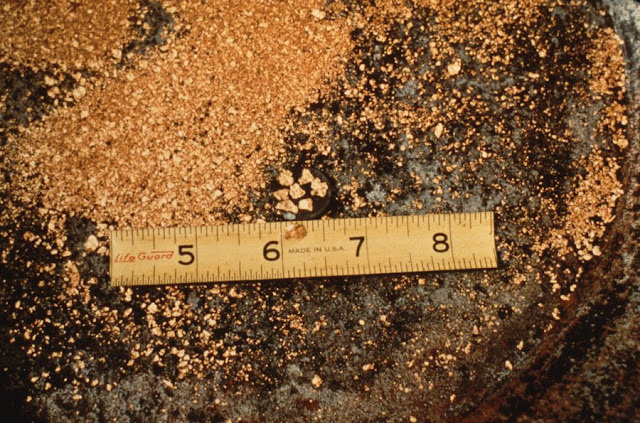 The earliest gold discovery in the US was thought to have occurred in North Carolina. Many gold nuggets were found along Little Meadow Creek including a 247.6 troy ounce (271.6 oz) nugget found in 1799. More than 1.2 million troy ounces of gold were produced from North Carolina from 300 properties over the years. Little Meadow Creek produced so many nuggets that it was called ‘the potato patch’ in reference to large nuggets. 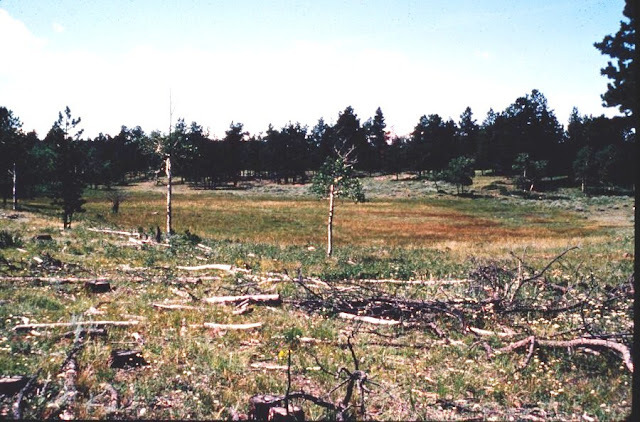 Not long after the North Carolina discoveries, gold was found in Georgia. A gold rush occurred in Dahlonega in 1829. 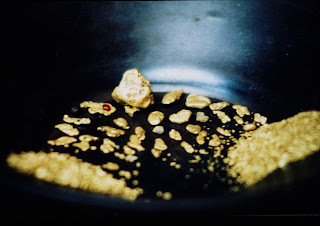 It is reported that as many as 500 gold placers and mines were operated in Georgia and many nuggets were recovered including nuggets of 54, 42, 40, 35, 26, 25, 19, 18, 15, 11, 6, 5, 4, 3 and 2 troy ounces. These were found in Gilmer, Habersham, White, Cherokee and Lumpkin Counties. Alaska is also known for its gold nuggets. The largest nugget found in Alaska was discovered in 1998 in Swift Creek near Ruby in central Alaska. The softball-size nugget, known as the Centennial nugget, weighed 294.1 troy ounces (332.7 oz). Another large nugget found on Long Creek near Ruby weighed 46 ounces. 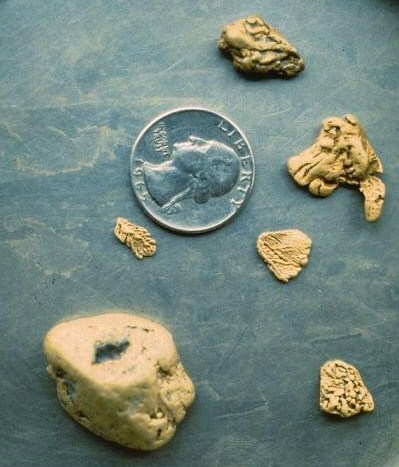 Large nuggets were also found on Anvil Creek near Nome in western Alaska. These included nuggets weighing 182, 107, 97, 95 and 84 troy ounces. In northern Alaska, nuggets of 146, 137, 61, and 55 troy ounces were found in the Hammond River within the Brooks Range near Wiseman. In the same region, a 42-ounce nugget was found in Nolan Creek in 1994. The Gaines Nugget (122 troy ounces) was found in the Kuskokwim of southwestern Alaska near McGrath, in 1985. Several nuggets weighing up to 11 ounces were recovered on Julian Creek in the Kuskokwim in 1988. Another nugget, known as the Chicken Nugget, was found in Wade Creek near Chicken in eastern Alaska in 1983. This weighed 56.75 troy ounces. 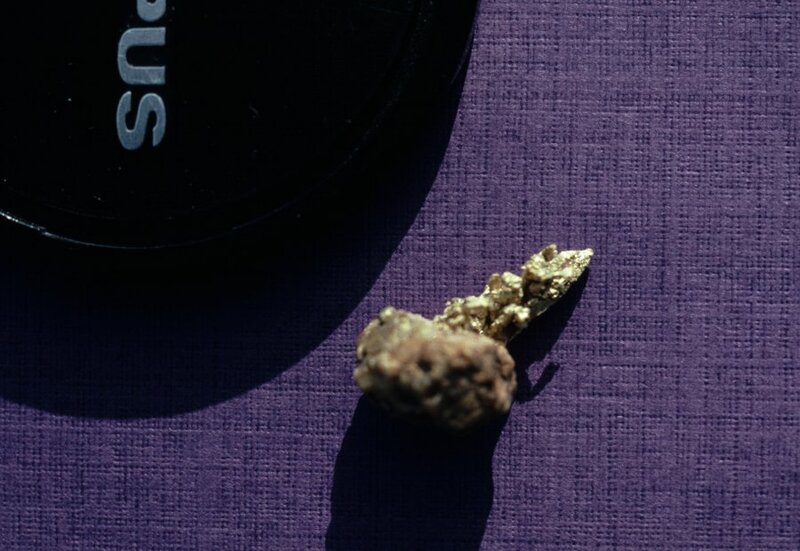 A nugget of 56 ounces was found on Dome Creek near Tolovana in central Alaska and a 52-ounce nugget was found on Lucky Gulch (Valdez Creek) near Denali in central Alaska. Arizona has yielded many gold nuggets, but these are primarily small compared to Alaska and California. This is probably due to the lack of active streams in the state as well as a possibility that a lot of gold mineralization in the state may be more disseminated, rather than in rich lodes like those found in Alaska and California. But personally, we believe that it is mostly because of the lack of surface water. A few of the better known places for nuggets include the Potato Patch at Rich Hill in the Weaver Mountains, and the Greaterville placers south of Tuscon in the Santa Rita Mountains. Several nuggets were discovered in the Greaterville placers including one that reportedly weighed 37 ounces. 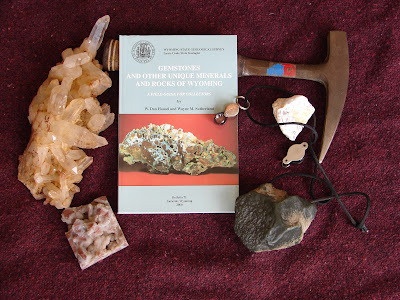 In the Weaver Mountains, samples of quartz with visible gold are often found along with some nuggets and gold in the Bradshaw Mountains has bee produced along Lynx Creek, French Creek, Big Bug Creek, the upper Hassayampa River, the Groom placers and in Black Canyon. 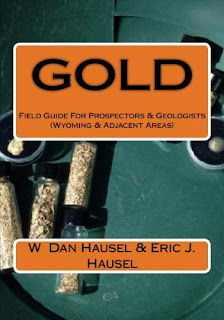 Based on the geology of Arizona, several gold deposits have likely been overlooked. 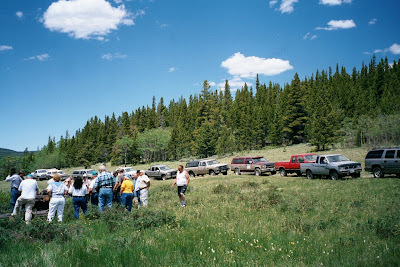 Large nuggets have been recovered in Montana, particularly at Alder Gulch and California Gulch near Phillipsburg in the southwestern portion of the state. In 1902, a football-size nugget of 612.5 troy ounces (672 oz) was recovered from California Gulch. This was followed by discovery of a 77 troy ounce (84.48 oz) nugget from the same gulch. The largest nugget found in Colorado weighed 160 troy ounces (175.5 ounces). This was named Toms’ Baby. It was found in 1887 on Farncomb Hill at the head of the French Gulch placer near Breckenridge. The largest US nuggets were from California. At Carson Hill in Calaveras County, a nugget weighing 2,340 troy ounces (2,567 oz) was recovered in 1854: the largest found in the US. Another water worn nugget of 648 troy ounces (711 oz) was found at Magalia, California in 1859. These were too large to have transported any distance. More recently, an 84-ounce nugget was found in Nevada County in 2010. And there have been many more from California. The largest nugget in Wyoming weighed 34 ounces (some sources suggest the nugget weighed 24 ounces). 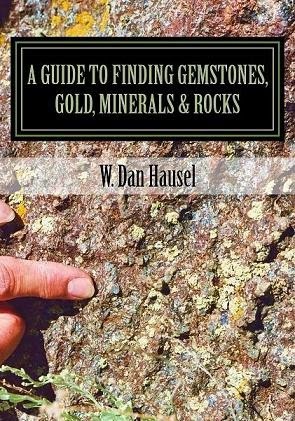 There is a very interesting reference to a boulder recovered in Rock Creek at South Pass that contained an estimated 630 ounces of gold. If so, this suggests this may have been a nugget with attached quartz potentially the size of a football. Wyoming has giant auriferous paleoplacers surrounding some of its gold districts (similar to areas in Arizona). Within those paleoplacers, particularly at the north and south flanks of South Pass and along the north flank of the Seminoe Mountains, are likely many nuggets. The Rattlesnake Hills greenstone is likely to produce a few nuggets based on the high gold content of metasomatic deposits recently drilled in this region. However, only immature drainages occur in this area that is not conducive for placer gold. What is reported to be the largest nugget found on earth was the Welcome Stranger. This nugget was found near the town of Moliagul in Victoria, Australia. It was in an eluvial deposit, rather than in a placer and was reported by some sources to have weighed 2316 troy ounces – or about the size of a small end table. However, this nugget had less gold that the Carson Hill nugget. Nuggets from Julian Creek, Alaska. 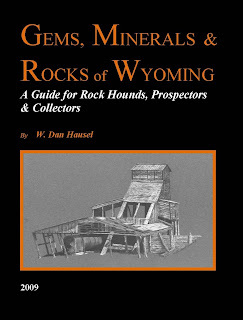 In the South Pass region in western Wyoming, historic reports claim ore from the Burr mine assayed as high as 1,700 opt and ore at the nearby Hidden Hand included material which assayed 3,100 opt. We seriously doubt these assays, other than a possibility rich and selected hand-sized samples were assayed. Instead, these likely were stories of prospectors embellished in local saloons. Samples that assay 1.0 opt Au or greater often show a trace of visible gold under a hand-lens (10x geologists’ loop). 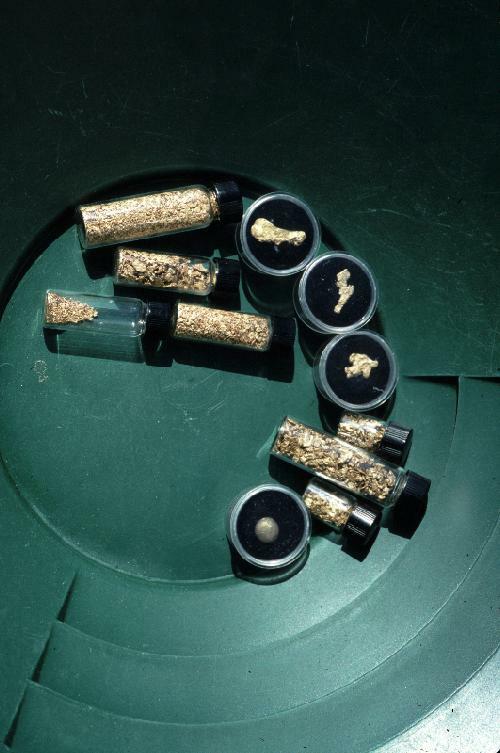 Samples with 100 opt gold would have considerable gold visible to the naked eye.